Stock photo of Pottery exhibit at Hessenpark (Open Air Museum), Neu-Anspach, Hessen, Germany, Europe. 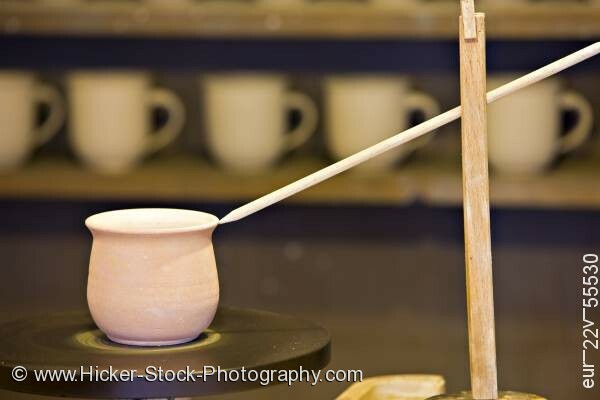 This stock photo shows a display of a partially made clay cup at a pottery exhibit at Hessenpark (Open Air Museum), Neu-Anspach, Hessen, Germany, Europe. A clay cup that is being made sits on a pottery wheel in front of a display at the pottery exhibit in Hessenpark. A long stick with a pointed end sits at the lip of the cup. This stick is supported by another piece of wood near the wheel. In the backdrop is part of the display showing five completed cups that sit on the shelf. A simple design is made with a curved handle and turned lip around the top of the smooth clay mug. This pottery exhibit is found at the Hessenpark (Open Air Museum). The open air museum was founded in 1974 in the town of Neu-Anspach of Hessen, Germany. Pottery exhibit at Hessenpark (Open Air Museum), Neu-Anspach, Hessen, Germany, Europe.